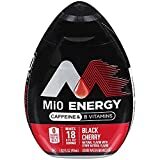 MiO Energy is a liquid water flavoring concentrate. The caffeine content is for following their directions of adding a 1/2 teaspoon of MiO to 8oz of water. A whole bottle of MiO would contain 1,080 milligrams of caffeine since there are 18 servings per bottle. 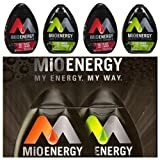 All flavors of MiO Energy have the same caffeine content. MiO isn't suitable for children or those sensitive to caffeine. Water, Citric Acid, Propylene Glycol, Caffeine, Contains less than 2% of Taurine, Guarana Extract, Ginseng Extract (Panax), Niacinamide, Vitamin B6, Vitamin B12, Natural Flavor, Sucralose, and Acesulfame Potassium (Sweeteners), Sodium Citrate, Potassium Citrate, Red 40, Blue 1, Potassium Sorbate (Preservative). How Does MiO Energy Water Enhancer Compare? 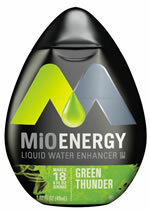 MiO Energy Water Enhancer contains 7.50 mgs of caffeine per fluid ounce (25.36mg/100 ml).